Breakdown voltage (I(BR) = 10 μA): 40V min. Reverse current (VR = 30 V): 1�A max. Forward voltage (IF = 1 mA): 310mV typ. Forward voltage matching (IF = 10 mA): 20mV max. Diode capacitance (VR=0 , f=1 MHz): 3pF typ. Differential forward resistance (IF=10 mA, f=10 kHz): 10Ω typ. Charge carrier life time (IF = 25 mA): 100ps max. 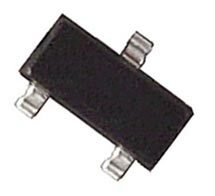 Manufacturer unmarked but based on the part number provided on the package the manufacturer is most likely Infineon.